St George’s Terroir Gin is not necessarily about the soil and climate and how it affects the flavor of gin as much as it is a celebration of that which paints an evocative picture of place. Anyone who has traveled the West Coast Pacific Highway in California and marveled at the verdant seas of Redwood and Douglas Firs, has experiences the inspiration which the distillers at St. George Spirits have seemingly captured in this gin. The signature fir and sage are distilled separately in a smaller still, while the remaining botanicals are distilled via gin basket. Interestingly enough, the St George’s Terroir Gin also features a special spin on coriander in that the team roasts it before distillation. Overall, the result is an impressive gin which genuinely transports anyone who takes a sip. Pine buds, spruce, fir and pine cones greet the nose. It’s immediately evocative. The forest seemingly is literally sitting in your glass. Absolutely brilliant. The palate is rife with more of the same, but with more specific flavors recognizable. Sage and bay leaves early, the sage meshes with resiny juniper, fir needles and becomes slightly more minty and cool tasting as the taste progresses. It tastes thick and rich, with nearly every manner of conifer combining at once. However, where I think it really shines is towards the finish where the sage retreats a bit and you get coriander and delicate spice. There’s a slight hint of lemon and citrus as well. The finish is cool and moderately long, with minty cool sage. Very smooth and extremely easy to drink on its own. St George’s Terroir Gin can add a festive touch to some more traditional cocktails. Consider using it in a Negroni or Martini for the holiday season. While it tastes like summer road trips to me, I know others find this a bit Christmassy. The Gin and Tonic is very heavy on the pine notes and may be a bit too piney for some; I think it tastes even better with a hearty squeeze of lime. Hence I really like this in a traditional Gin Fizz as well. The one place where I found St George’s Terroir Gin to be a little lacking to me were in the dessert cocktails. The pine cream note might be a little “too unusual,” so I generally stay clear of the Ramos Gin Fizz or the Gin Alexander. But overall, I really like drinking this gin neat. Straight from the bottle and breathing deep in the sweet sweet aromas of fir and juniper. 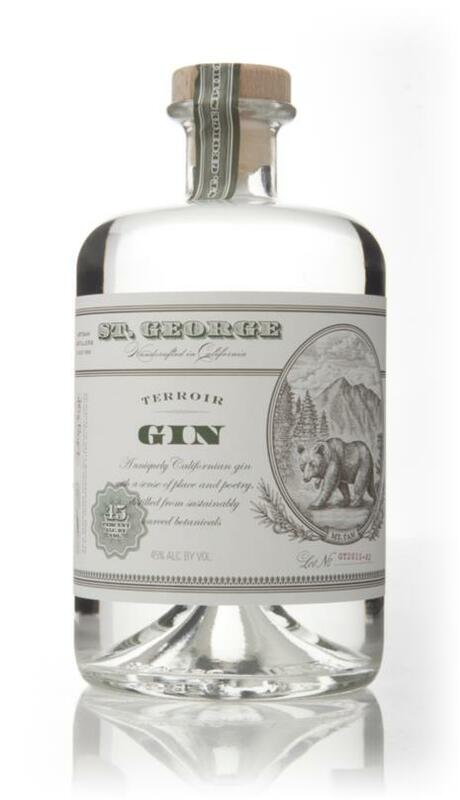 St George’s Terroir Gin is one remarkable gin. Few things amplify juniper as Douglas Fir can. Beautiful, distinctive, evocative, memorable. Fans of classic style gins will find plenty to love, even as the abundance of additional botanicals push it almost to the realm of contemporary style gin. I highly recommend this gin to all drinkers, as it’s an absolutely beautiful spirit and one of my favorites. Highly recommended. I love this gin, but because of it’s unique and strong herbals, I was afraid to mix it into a cocktail for the longest time. Just sipping it alone as an aperitif or evening cocktail is amazing. After reading some of the recipes on the St. George’s website, I got inspired and tried some things. It can fantastically balance with a fruity liquor and some lemon. One of my favs combines Terroir, Cointreau, an apple/cranberry sparking cider (e.g. Maritinell’s), and a bit of fresh lemon juice.